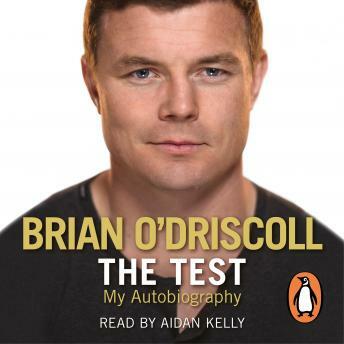 Penguin presents the unabridged, downloadable, audiobook edition of The Test, the stunning autobiography from rugby legend Brian O'Driscoll, read by Aidan Kelly. Between 1999, when he made his international debut, and his retirement in 2014, there was no greater player in world rugby than Brian O'Driscoll. In 2010 Rugby World magazine named him its world player of the decade - and since then the legend has only grown. Along the way, he was tested - by personal loss, off-the-field pressures and career-threatening injuries. The Testis a book about how he took on those challenges - how a world-class talent developed a world-class work ethic and temperament. As he lost his youthful pace, O'Driscoll's reinvented himself as a player, revealing the remarkable character and drive behind the glittering gifts. In the latter years of his career, he put in a sequence of gladiatorial performances that etched themselves into the minds of every rugby fan every bit as indelibly as the legendary early tries in Paris and Brisbane. Honest, gritty and thoughtful, The Test is not just an essential sports book. It is an essential book about family, friends, hard work, courage and imagination.